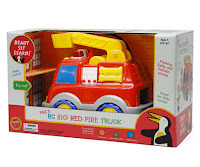 Lest you be tired of my humble opinion, here's yet another gift idea for the young 'uns in your life: A radio control fire truck made by Discovery Channel Toys! My sister in law was just telling me about this toy! Love it. Feel so bad for middle guy... my oldest and middle guys had bronchitis last week. Little man had an ear infection. And my husband and I got bronchitis too. So much fun in our house... and we're all still a bit sick. Damn colds! Check out our blog today... one of us is pregnant and we're having a big contest to guess who!!? ?